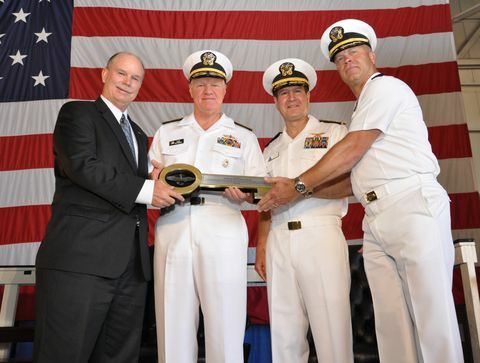 NORFOLK, Va., July 30, 2010 -- The first Northrop Grumman (NYSE:NOC) built E-2D Advanced Hawkeye aircraft to enter the U.S. Navy fleet was "welcomed home" on Thursday in a ceremony held at Norfolk Naval Air Station in Virginia. As U.S. Navy leadership, Northrop Grumman officials and members of the U.S. Navy's E-2 community looked on, Admiral Gary Roughead, chief of naval operations, accepted delivery of the aircraft on behalf of the U.S. Navy. "Today is a major naval aviation milestone," Roughead said. "The E-2D is ready, relevant and capable. It's going to be a game changer with information dominance for the U.S. Navy. I am very pleased today to accept delivery of the first E-2D to enter the U.S. Navy fleet." As the U.S. Navy's carrier-based airborne early warning and battle management command and control system, the E-2D Advanced Hawkeye, with its newly developed AN/APY-9 radar, works in concert with surface combatants equipped with the Aegis combat system to detect, track and defeat cruise missile threats at extended range. A new rotodome contains critically important, continuous, 360-degree scanning capability, while adding an electronically scanned array. This system allows operators to focus the radar on selected areas of interest. Under a $408 million contract, awarded in July 2007, Northrop Grumman is producing two additional pilot production aircraft which are on track for delivery in 2010. Manufacturing of four Low-Rate Initial Production aircraft also is progressing well. "The men and women of Northrop Grumman go to work each day with no greater priority than supporting the warfighter," said Gary Ervin, corporate vice president and president of Northrop Grumman Aerospace Systems. "The E-2D's systems represent a multi-generational leap in technology. It is built to be relevant for decades to come and will greatly facilitate how the Navy manages the complex, modern battlespace and emerging threats of today and tomorrow." The first Navy squadron to operate the E-2D Advanced Hawkeye is Airborne Early Warning Squadron ONE TWO ZERO (VAW-120), based in Norfolk. As the Navy's Fleet Replacement Squadron (FRS), the "Greyhawks" train pilots and naval flight officers to fly the aircraft and operate the systems before assignment to an operational flight squadron. Lockheed Martin Mission Systems and Sensors, Syracuse, N.Y., serves as the principal radar system supplier and is teamed with Northrop Grumman, Baltimore, Md., and Raytheon Company's Space and Airborne Systems, El Segundo, Calif. BAE SYSTEMS, Greenlawn, N.Y., is responsible for the IFF system. L-3 Communications Randtron, Menlo Park, Calif., developed the new rotodome and UHF electronically scanned array antenna. Northrop Grumman, Woodland Hills, Calif., provides the E-2D's new, integrated tactical cockpit. Rolls-Royce Corporation, in Indianapolis, provides the T-56-A-427A engine and propulsion system.